Let Election Day be a lesson to us. The next time we hear from the media—and you know it won’t be long—that gun control supposedly reduces crime, or that it has the support of 160 percent of the American people or 125 percent of NRA members, or that whatever pet political cause they want to promote is a “done deal” and that resistance is futile—don’t you believe them. Because as the 2016 elections prove, the media don’t know what they’re talking about, or the media are lying—or both. 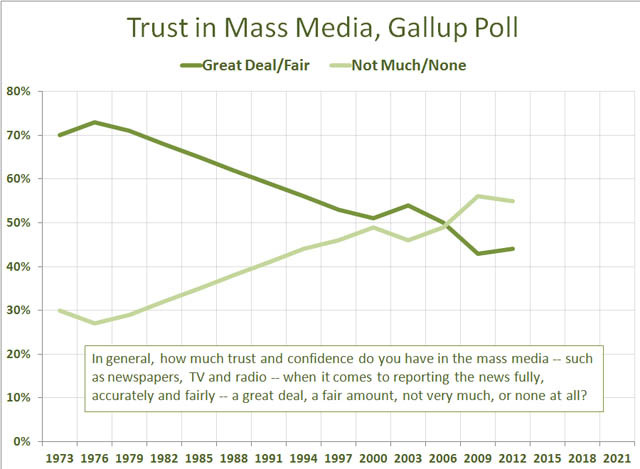 Americans’ distrust of the media has been growing for decades. But have we ever seen such a shameful spectacle as we saw throughout this year’s election campaign, when the media abandoned even the pretense of fairness and, with few exceptions, went shamelessly en masse in the tank for Hillary Clinton? Remember how, on election night, NBC News chief foreign correspondent Richard Engel said a Trump presidency would be “catastrophic to the United States”? … more than 90 percent of the D.C. press corps vote for Democrats in elections.Or how ABC’s Martha Raddatz relentlessly badgered and interrupted Donald Trump during the Oct. 9 presidential debate—and then on election night, as Trump pulled ahead of Clinton, she grew weepier and weepier as the night wore on? Since Election Day, the media’s excuses, deflections, recriminations and self-flagellation have only grown more desperate by the day. “How did we get it so wrong?” they lament. The pollsters may share some of the blame, to be sure. Clearly, most of them underestimated the widespread support for Trump and opposition to Clinton among the electorate. Whether this was by deliberate design or defects in their methodology remains to be seen, but one fact is sure: Journalists in this country, with few exceptions, wound up with egg on their faces on election night. If they honestly believed the tales they were telling the American people, maybe it was a case of mass delusion that grew out of wishful thinking. After all, these are people who share the same politics. Journalists who identify themselves as Democrats outnumber Republicans by a factor of 4 to 1, and more than 90 percent of the D.C. press corps vote for Democrats in elections. They go to the same cocktail parties. They send their kids to the same schools. They read the same magazines and newspapers. They watch the same talk shows and listen to the same radio programs. They can’t imagine that anyone would think differently than they do.And [the mainstream media’s] failure on Election Day, no less than Clinton’s, is a direct result of that arrogant disregard. And to an increasing degree, these supposed “public watchdogs” have an incestuous relationship with the politicians and political operatives they pretend to keep honest. As the Washington Post has reported, there are so many journalists either married to, or sleeping with, or colluding with members of the Obama White House, and the Democratic Party, that they might as well be one and the same. In other words, they’re all part of the same political-media elite, living in the same echo chamber in Washington or New York or Chicago or San Francisco, who have no concept of, or care for, the concerns of most Americans. And their failure on Election Day, no less than Clinton’s, is a direct result of that arrogant disregard. So: What can we do about it? Obviously, there’s no way to control free speech, particularly political free speech—even if controlling it were desirable, as so many of those self-proclaimed “guardians of free speech” seem to think ... even while they “fudge” the truth. No, the best way to combat dishonest or deluded free speech isn’t with less speech, but more. That’s why new media is such good news for truth, democracy and the rule of law in this country today. No longer do Americans have to rely on the Big Three networks for their news—or even any of the national media corporate conglomerates that try to tell us what to think and what to say. Media outlets like A1F Daily, NRA News and now NRATV are redefining the marketplace of ideas in this country. They’re telling the truth about firearms, about your freedom to own them, why we own them and how that freedom guarantees our way of life—the truth that the national legacy media either ignore, suppress or malign. When self-proclaimed media “watchdogs” of those in power become the lapdogs and attack dogs of those in power—and then lie, deceive and spin every story 100 ways both noticed and unnoticed every day—the American people simply pull the plug and go elsewhere for their answers. Election night was evidence of that, it was a product of that, and it was the American people’s correction of that same elitist arrogance, disconnectedness and smug sense of enlightened entitlement that defines too much of the “mainstream” media in America today.